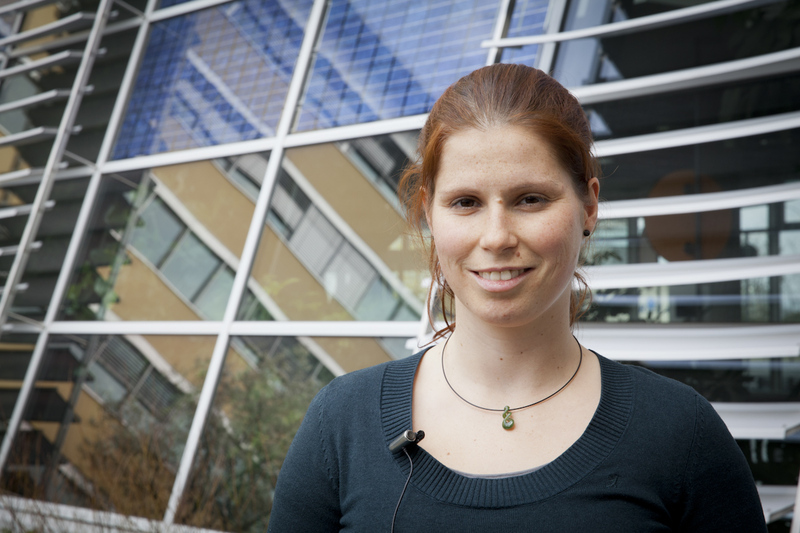 My name is Alma Spribille and have studied energy and environmental management in Flensburg. This is an industrial engineering degree program specializing in renewable energy. The solar energy has always fascinated me the most, because the thought of the sun producing energy is very intuitive, all plants do that. Technically implementing this process is exciting. So I’ve done a study project at the Fraunhofer ISE on module connection (Modulverschaltung), and then I came back for the thesis, and work on the development of solar cells. Now I have been working at the Fraunhofer ISE for almost four years on the development of new solar cell structures. What is the name of the research area? Crystalline silicon solar cells (Kristalline Silizium-Solarzellen). We do industry-related research, that means solar cell concepts that we think the industry can implement in the next three to five years. Another division does more long-term research, that means solar cell concepts that are currently still relatively far away from the industrial implementation, but potentially can be implemented at some point. The focus is definitely to make the solar cells more efficient and more cost-effective. At the moment I do economic calculations of various solar cell concepts: for example of a standard solar cell, as they currently produced, and a so-called aluminum BSF solar cell (Aluminium-BSF-Solarzelle) and compare them to a passivated rear side solar cells (passivierte Rückseiten-Solarzellen) or MWT solar cells, that allow for higher efficiencies. The point is to assess whether it is worth to invest the extra effort and additional production steps. How did the solar cell research develop from niche experiments like on the Rappenecker cottage which is not connected to the power grid, to the top-level research today? How did it work to improve the solar cells? The Rappenecker cottage was equipped with solar panels in 1987. That was quite at the beginning of the development of photovoltaics. The first solar cells however were constructed much earlier, in the 1950s. The first photovoltaic modules on rooftops were installed in the 1970s. Most pioneering projects were like the Rappenecker Cottage off-grid power supply far away from the normal power grid. In the mountains you have to respect environmental protection, because it is a place where people come to relax and enjoy nature. So there is the motivation to search for solutions that replace the diesel generator. Very often there were very dedicated people who had a lot of interest in doing research on solar energy. It was definitely not cost-effective at that time. In the 27 years since the installation of solar cells on the Rappenecker cottage almost everything has improved. Since then, the way how we process the silicon improved in many ways. Firstly, the anti-reflective coating has improved, the material itself has improved and if the material is better, then it also increases the efficiency. We can improve the light trapping with the anti-reflective coating or with the texture and the doping on the front side, the so-called emitter has to be contactable must with the metal, that collects the electricity generated. Especially in this area there has been a very great progress, now all the characteristics of solar cells, the voltage, the current and the so-called filling factor (Füllfaktor) have greatly improved. I think the emitter formation (Emitter-Bildung) and the contact (Kontaktierung) has improved the most between then and now. Many people believe there won’t be any more improvements in solar technology. From a scientists point of view, where do you still see potential for development and where has the limit already been reached? 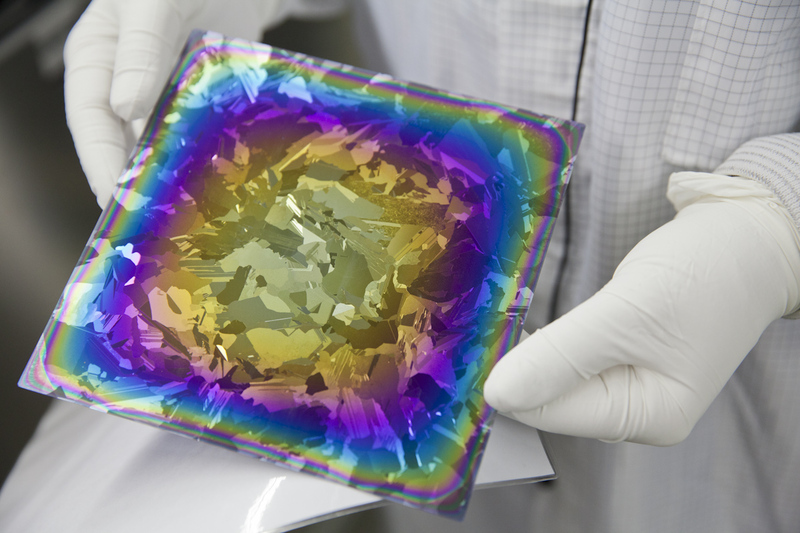 The limit has not been reached yet for crystalline silicon solar cells. There is one company, Sun Power, which has one of the highest efficiencies in the world, with over 24% efficiency in converting solar energy into electricity. Inside the module a bit gets lost. Sun Power makes cells in which the entire metallization is on the rear side, thus there is no shading on the front. They also use a solar cell concept in which they use a very high quality silicon and can achieve very high efficiencies. It doesn’t pay of for mass production yet, it is a premium product on the market. The modules look really good, they are completely black, the cell is black, the back sheet of the module is black and the frame also. When you see the rooftop, you simply can’t see anything blue and no metal, it’s just black. These cells are the best at the moment. Then, of course, there is a theoretical efficiency limit of silicon solar cells, which is due to various physical loss mechanisms. Depending on the loss mechanisms you think are given or can be avoided, the theoretical efficiency is about 29 percent. That means we won’t get beyond this efficiency (with silicon solar cells). But that is already a high degree of efficiency. The best efficiency of a plant is 2 percent conversion of sunlight in photosynthesis and the entire world depends on photosynthesis. I think the efficiency is not necessarily decisive factor, we need more space to generate enough power. There is certainly a limit to the efficiency that we will achieve and that is realistic to implement at a reasonable cost-benefit ratio. But the so-called external costs are very low for the solar energy, because there is no pollution from solar energy like there is from conventional energy sources. That’s the advantage. It is important that you check first if the house has a north-south or an east-west orientation. Normally you prefer to have a south-facing roof area, because it gets the most radiation from the sun. Then the angle of the roof surface is important. Normal one-family homes in Germany have about a roof pitch of 30 °. That is suitable. Then is important to check if there is shadowing on the roof from high neighboring buildings or trees, because the more shading I have the worse it is for crystalline silicon. But then you could take solar cells made of other materials. I would say it pays off in any case. Apart from the feed-in tariff, we know that solar power from a crystalline silicon module has a production cost of 7-10 cents per kilowatt hour over 20 year lifetime of the module (as guaranteed by the manufacturer of the module), depending on which technology you use and how big the system is. The electricity from the grid costs about 20 cents, depending on the provider. If you buy a photovoltaic system, you have indeed an initial investment, but over the life of the module the solar power is already cheaper than the retail price we pay for electricity from the grid. So I would definitely say: Do it! Where is the research heading now? Which points need improvement the most? In the solar industry, there is an important point, which we are working on. The idea is that we want to have fewer metallization on the front, by putting it on the back where possible. This way we have less shading on the front and that allows us to produce highly efficient solar cells. The starting material for silicon solar cells is currently so-called p-type silicon, it is doped with boron, that means it’s doped positively. But you can also take a material that is doped negatively with phosphorus. This allows higher overall efficiencies, but is a bit expensive to produce and there are not so many manufacturers for it yet. This is certainly a trend that will be followed more in the near future. Then the research goes towards decreasing the cost per Watt peak, to make solar energy cheaper because this is very interesting for the end user. What is explored along with many other energy policy issues at Fraunhofer ISE are storage technologies. Solar power is not produced on a regular basis, because the sun is not always shining, the same is true for electricity from wind. So we need to store the electricity from renewable sources in order to always have it available. Storage technologies are needed not only for the electricity in the grid, but also for applications such as the one on the Rappenecker cottage, which is self-sufficient. There is a lot of research and development going on. What should energy users know? I know that many people have prejudices against solar energy. An example from my own family: my sister has bought a house and I would like that they installed solar panels on its roof. I am willing to pay the project, there are ways to make special leasing contracts for roof surfaces. But I realize that people who are not so familiar with solar energy are very skeptical of it and the psychological barrier is relatively large as well. I would argue that is among other factors the large lobby for the conventional forms of energy that make sure many people are not properly informed. In my opinion, anyone who has a house with roof with a reasonable roof inclination should consider to install photovoltaics because it is simply pays off. Last Saturday there was a rally in Freiburg for the energy transition. The director of EWS Schönau, who are a prime example of how to distribute renewable energy, said that already half of the kilowatt hours coming from renewable energies in the German electricity grid are from installations that citizens invested in. Thus we see that private citizens have realized this is a way for us, we can do something. So I would say to anyone, as I also say to my sister: You are doing something good for the environment on the one hand, but you don’t have to be “eco” to do that, it also makes sense economically.